What do you think of it? I didn't find a script font that would feature such extravagancy. My suspicion is that by now the readers of Slovak and Czech are so used to seeing the wedge hacek in print, that including those full carons in a font could be mistaken for lack of knowledge instead of purposeful action (a bug, not a feature). I also wonder if, thanks to print and computers, the wedge-shaped hacek is more often employed in handwriting then not? I stumbled upon an article about a new simplified script for teaching in Czechia that has been tested in a few select schools, as well as a discussion about this. Since this ‘new’ script is a typeface and was developed by a type designer, of course it features the wedge-shaped carons. What bugs me is why ‘L’ and ‘t’ were also blessed with the mini-caron. I get that ‘d’ and ‘l’ as letters with ascenders will often be taller than capitals and as such are worse at accommodating regular accents. But the idea that “‘t’ is a tall letter” is a misconception that has been paining me since day 1. And ‘L’ is just as bad as the other capitals, except for maybe the fact that it has only the stem at the top and there would be a huge fight like the one about placing circumflex over ‘h’ for Esperanto etc. So perhaps the thing with ‘t’ and ‘L’ is more about horizontal metrics? Meanwhile /dcaron and /lcaron are liabilities because you have to kern them. Since we live in the age of line spacing defaulting to 120% or so in most software, wouldn't it all be easier if we switched back to regular carons for all? Back to the main question, what do you think of the following? To state the obvious: I figured /L would go better with a full caron since there's more going on at the top than in a print ‘L’. Other than that, the other letters look good with the semi-caron, but I just wanted to see what happens, test the waters, and maybe use this solution in another project, where it could actually solve a problem (this would be more useful with a bolder weight, where the semi-carons create spacing issues). The main problem I see here, besides maybe disturbing the reader, is that the carons are more on top (in /d even more on the left) than on the right of the letter, which seems to be desired whatever the form of the accent itself. But then again, I sense that the rightward positioning of hacek in handwriting may have been influenced by print... I'm a bit confused. "... switching the caron to the wedge shape for ..." – switch from what? In my view, the caron always has been a wedge shape. If you are referring to a more rounded shape, that's another accent: a breve. Switch from the inverted circumflex shape to the apostrophe shape — which I called wedge, because it is discouraged to design it like an apostrophe today, at least in sans serif fonts. The diacritic found on the letters /dcaron, /Lcaron, /lcaron, /tcaron is an actual caron (semantically), although in print it resembles an apostrophe. This is not a misnomer like the /tcedilla case. Btw a wedge is, by my standards, a filled shape (otherwise it would have to be made from a very rigid material to be useful). I think to judge the options a deeper view into the history of czech writing, printing, lettering and sign making would be advantageous. I’m not sure looking to historical design is a good thing. Sure it’s a nice intellectual exercise, but bringing back old ideas may just confuse readers now that they’re used to something else. In her talk about digital Bengali types Fiona Ross explained that some Bengali readers were unhappy to see conjunct forms from older Bengali chirography being brought back in print! In her talk about digital Bengali types Fiona Ross explained that some Bengali readers were unhappy to see conjunct forms from older Bengali chirography being brought back in print! At the time Linotype Bengali was introduced, yes. But now that typeface is the most frequently used — in dozens of unofficial versions — and influential design in Bengal and Assam and Bangladesh, and the conjuncts restored to the script after the enforced simplification of earlier technologies are very much the norm. In addition to the basic shape of the caron (reminiscent of a small letter v), there is also the vertical form used in Czech for the letters ď and ť(and in Slovak for ľ and Ľ), which arose due to technical reasons – the classic caron simply would not fit together with the ascender of the letter, or rather take up too much space. In handwriting, the caron usually has just one shape for all letters – a breve (“swoosh”) or more or less horizontal stroke; the pointy version almost never appears in handwriting. Does this shed some light? Would one be wrong in trying to follow the handwriting model in a script typeface? I wasn't fully aware the caron is usually rounded in writing, so one more thing to consider. [I]n normal handwriting, Czechs usually write a basic caron next to the letter instead of a vertical caron (dˇor tˇ)*. Nevertheless, the correct, vertical form is used in calligraphic fonts and type designers view the use of the basic caron as incorrect. Sadface I sense this provision is rooted in the preconceived notion of a font. There are lots of script fonts that at first glance look like handwriting, and at a closer look, they are just not-so -special fonts. But how about we don't care about Czech type designers and ask users? Anyway, my positioning as in the original post is off, the regular caron should be placed to the right of the ascender, if at all. I was aware of that, but I couldn't pull it off without changing the base letter and thought it was not a big fault to place it centered above. The standard Czech keyboard has no letters ťor ď. Instead, they are typed in the same way as capital accented letters – first the separate non‑spacing caron (ˇ), then the letter. To date, this is how upper‑case accented letters are typed on all hardware and software key-boards – except for iOS, which ignores this established method. *And btw, our splendid webfont not so all right again. I’m not sure looking to historical design is a good thing. And I am pretty much sure that it is a very good thing to do. Because it helps to understand how things evolved in the one or the other direction. Which conclusions I then draw from my observations is a totally different thing. But what happens? Repeatedly, when one says ‘have a look at the old stuff’ someone else replies with ‘don’t go for it!’. – Just realise that look at it and go for it are different things. Adam, I think the use of v-shaped caron above or next to d/t/l depends on the style of the font. If you would digitalize the official handwritten letters pupils learn in the school, then the “letter followed by breve-like caron" would be the right solution. 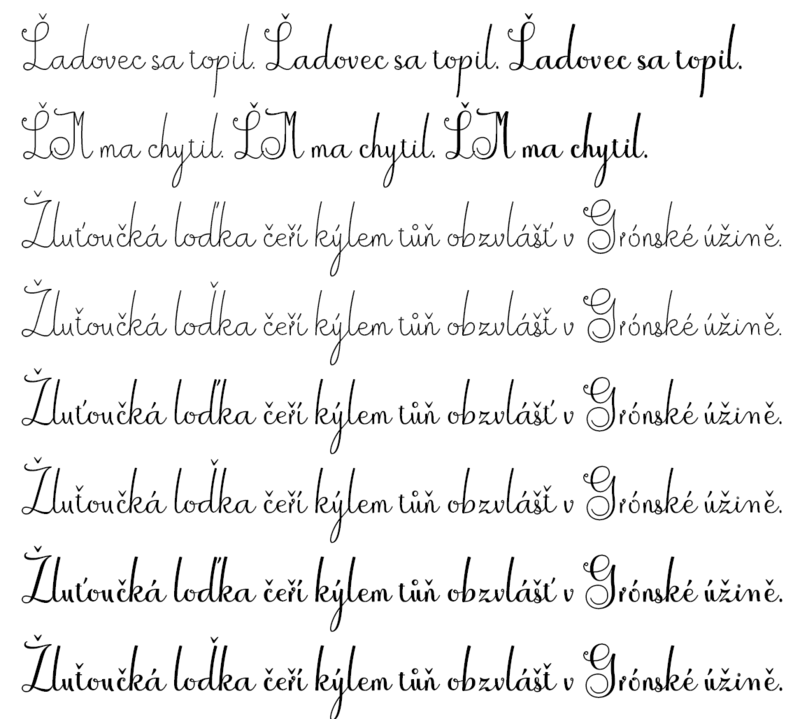 If you’d decide to make a font from Czech handwriting, then again, you could do that. But as soon as you start to make the font perfect, as soon as you following calligraphic principles, then you should use the vertical caron. Of course you can do whatever you want. And yes, you mentioned vox populi. I guess 99% readers would not care about the shape of the caron. This is just a tradition. And the tradition wants us to use vertical caron in calligraphy, lettering or type design. So would you say pupils are not taught to write vertical carons for the same reason they're not taught to write two-storey /a/g? I wonder if that will change if Radana Lencová's Comenia Script is adopted. But predictably not, since, as you pointed out, most people don't care. But if the samples are printed in handbooks this might quietly happen. Adam, Comenia script was approved by the Ministry of education and it is one of the two official forms. 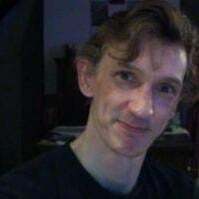 Directors of elementary schools can choose their preferred way of teaching writing skills, hundreds of elementary schools switched to Comenia Script, either completely or partially (some schools offer both, classes with Comenia and classes with “traditional” connected script respectively). I guess there will be a significant group of teenagers soon who will naturally use vertical carons in their handwriting because that’s what they have learned in elementary schools. I am not interested what most people do. People voted for brexit, people elected Trump or PIS in your country. Yes, and the awful Zeman in my country. So I really don’t care how people who can hardly write a meaningful sentence write their carons. I believe typographers or calligraphers should educate, do the best, not follow the herd.